In 1963, a young boy from the Brooklyn housing projects took a trip with his aunt to see The Radio City Rockettes. It would change his life forever. After the show, they stopped to eat at The Automat, a fast food restaurant lined with banks of gleaming coin-operated vending machines. The boy was fascinated. How, he wondered, could you produce a piece of pie by dropping a quarter into the slot and pressing a button? That boy was Howard Schultz, who would grow up to create a business empire that revolutionized the way Americans consume coffee. "She told me there was a magician on the other side," Schultz said. "Of course, I believed it." The experience sparked a passion for bringing "theater and romance" to retail. Schultz, now 63, is one of five influential leaders profiled in CNNMoney's The American Dream: New York. Their careers, talents and individual narratives are all different, but what unites them are a common origin and a passion for preserving the ability of future generations to rise like they did. In addition to Schultz, the project features J. Crew CEO Mickey Drexler, former Xerox CEO Ursula Burns, hip-hop legend Russell Simmons and former Federal Research Chairman Alan Greenspan. Each overcame adversity to achieve success beyond their highest hopes. Today, the American Dream is in question. Many Americans believe it is too elusive to ever achieve, and President Donald Trump effectively campaigned on the idea that it was dead and only he could revive it. It remains to be seen how big of a difference Washington politics and policies can make. For now, the lives of these five business leaders show the American Dream's enduring power. Schultz grew up in the Bayview Houses, a public housing project in Canarsie, Brooklyn. His family's hardscrabble existence in the low-rise buildings was a stark contrast to the glamor of Midtown Manhattan. "There was no way out. My father was uneducated, my mother wasn't working. It was just a tough time. As I got older, I just felt really bad for them," Schultz said. As a teenager, Schultz realized his athletic ability was his only ticket out. A football scholarship at Northern Michigan University afforded him the escape hatch he desperately wanted. After graduating, he started a career in sales, eventually landing a job at a maker of drip coffee machines. One of his clients was a small Seattle café called Starbucks. The rest is history. 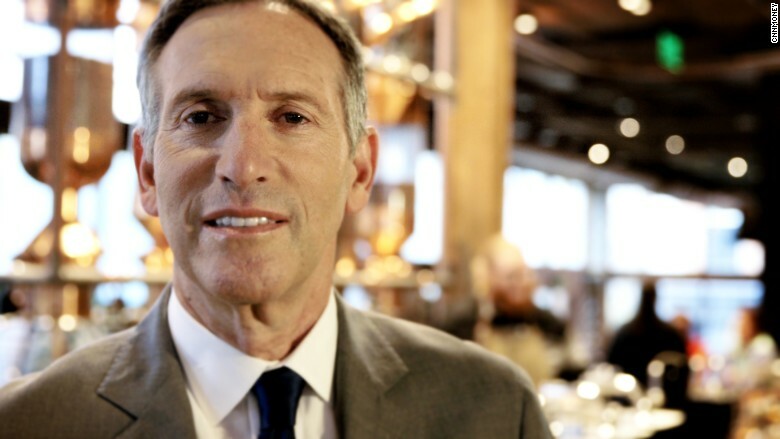 Starbucks CEO Howard Schultz says his childhood gave him the motivation to succeed in life. Like the other leaders profiled for the series, Schultz has achieved the American Dream. He regrets, however, missing the chance to tell his parents how much their struggle inspired his success. "I don't think I would have had the motivation, the curiosity and the fear of failure if I didn't come from the background I have," Schultz said. "The most vulnerable thing I can say to you is I still have fear of failure today." But he worries whether young people today have the same opportunity for advancement. It's a message he's been touting for years. "You can't have a society in which six million young people are disconnected because they're not in school and they're not working and everyone feeling as if it's not my responsibility to help," said Schultz. "It is our collective responsibility as Americans to lift everyone up." Schultz is stepping down from the helm of Starbucks in April. Instead of running the company, Schultz will become executive chairman and focus on innovation, premium offerings and, most importantly, social impact. Part of his mission: helping to revive the American Dream.